May Day, the first of May, has been the ‘official’ International Workers’ Day since 1891 when the Second International, the successor to the International Working Men’s Association (women, for some reason unknown to me, were not considered in those early days of conscious and organised socialism and in the establishment of one of its most important organisations) – which came to be known as the First International – following the outbreak and rage at the events that followed the meeting of striking workers in Chicago, USA, on May 4th 1886. Organised labour in the United States had set the date of May 1st 1886 for the gaining of an ‘Eight hour day without any cut in pay’. This followed similar movements that had developed in Europe. The movement began as early as 1817, after the coining of the slogan ‘Eight hours labour, eight hours recreation, eight hours rest’ in Britain, the birthplace of the Industrial Revolution. This was emulated in other European, industrialised countries and became an official demand of the First International soon after its formation. When the employers refused to cede such an improvement of working conditions thousands of workers throughout the United States went on strike. In Chicago the workers were particularly well organised. By the latter part of the 19th century the city had become one of the most important in the USA (especially after the Union victory in the Civil War) as it was not only an important transport hub linking all parts of the country but also a growing industrial centre due to the advantages these links to the rest of the country offered burgeoning American capitalism. On top of this it was the stockyards, receiving, slaughtering and processing millions of cattle from the western plains, that virtually fed the country. These conditions created the environment for a strong trade union movement which grew in reaction to the dire conditions which always reign in rapid capitalist expansion – the stockyards, especially, being as unpleasant for the workers as they were for the animals. A series of meetings, rallies and demonstrations were organised in the days following May 1st as the workers stepped up their pressure on the employers. On the Tuesday 4th, a peaceful meeting had been taking place for some time when massed police ranks arrived and demanded that the speakers ‘desist’ and the crowd ‘disperse’. Immediately after that demand a bomb was thrown at the advancing police and seven died either there or of their wounds. Gunfire broke out, 4 demonstrators were killed, dozens wounded and about 60 police suffered from gunshot wounds of varying degrees – mainly, it was commonly accepted, from the erratic firing of fellow officers. Who actually threw the bomb and why was never proved beyond doubt. However, what was certain was that it was the organised workers who were tried, 4 of them eventually being strangled on the gallows – they didn’t ‘hang’, by accident or design, as they didn’t fall so as to break their necks. What was also certain was the anti-red, anti-trade union purge that followed as well as a concerted press campaign to vilify the workers and promote the police as innocent victims of dangerous, out of control, anarchists. This is a circumstance that has been repeated innumerable times in the years since, in all parts of the globe. Conspiracy trials go against even the bourgeois legal tenet of ‘innocent until proven guilty’ as the burden of proof is laid at the feet of the accused, not the accusers. In the heightened environment that often surrounds such trials the chances of the accused being found not guilty is remote and for thinking individuals the whole affair is seen as a stitch-up and a gross miscarriage of justice – in Britain it’s sufficient to mention the case of the Tolpuddle Martyrs (farm workers transported to Australia for forming a union in 1834) and the Shrewsbury 24 (tried and convicted of conspiracy, although the way the media presented it they were guilty of using and threatening violence, after the 1972 building workers strike). Demonstrations and strikes on May Day became the focal point for struggles throughout the world as the working class started to stand up for its rights and the red banner of communism flew over more and more streets – for the truth of any society is that whoever rules the streets rules the country. 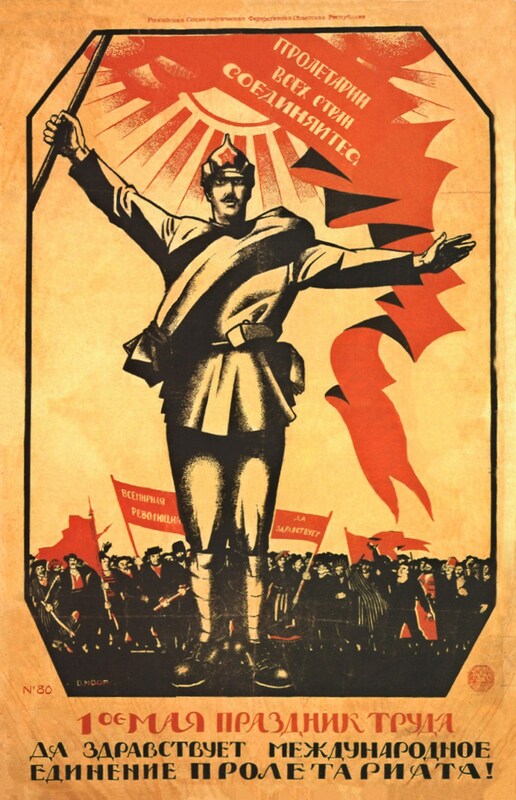 With the victory of the first workers’ and peasants’ revolution in Russia, which became the Soviet Union, May Day took on an even greater importance. Each year as the workers and peasants marched through Red Square when they took a break away from the collectivisation and industrialisation of one sixth of the worlds’ land mass, they were throwing down a challenge to the workers in the rest of the world – do you want to live in freedom or remain under the yoke of capitalism? After the victory of the revolution in what became the Peoples’ Republic of China in 1949 the May Day holiday became one of the major public holidays in the country. This remained until just a few years ago (even after the restoration of capitalism under the ‘running dog and capitalist roader’ Deng Tsiao Ping who had led a successful counter-revolution and managed to fool the population that for individuals ‘to get rich’ was the best way forward for the country and the people). The result might be that, on paper, the country is becoming richer but that is only because more and more of the wealth of the country is in the hands and under the control of a small number of billionaires with the consequence that hundreds of millions find their conditions of life getting worse day by day. Until May Day yet again becomes a rallying point for the Chinese people they will only see the situation of the vast majority of the population becoming worse. In capitalist countries strikes and demonstrations on, or around, May 1st were an indication of the success and effectiveness of trade unions and other working class organisations. It’s a truism that the level of international solidarity depends upon the determination and ability to fight for local advances in conditions or against attacks on workers’ rights by home-grown capitalists. Solidarity with struggles of other workers throughout the world was at its height, in Liverpool, in the 1970s when organised labour was fighting throughout the area on issues as diverse as: shorter working hours; against factory closures – which included many occupations, takeovers and sit-ins; welfare benefit rights; rent strikes; supporting struggles to maintain the gains under the welfare state in health and education, to mention just a few. Unfortunately, for reasons of lack of leadership and lack of clarity of thinking on behalf of the workers, most of these issues were defensive and we live with the failure to go on the attack and fight for a socialist future that has led us into the situation we now find ourselves. It was in this highly charged political environment that international solidarity found fertile ground. The flag of the Vietnamese National Liberation Front flew over the streets of Liverpool as opposition to American aggression in Indochina grew stronger and louder. The May Day of 1975 was a special affair. Coming the day after the liberation forces’ tanks had crashed through the presidential palace and the lackeys, hangers-on, whores and spivs had fought to get out on the last helicopters to leave from the roof of the American Embassy – the machines to be later pushed off the aircraft carriers of the ‘mightiest nation on the planet’ into the South China Sea – that May Day demonstration was both a celebration of a shared victory and a declaration of intent on other fronts. Support for the struggle of the African people against the racist and apartheid regimes in Rhodesia, South Africa, Mozambique, Angola and Guinea-Bisseau were also at their height during this period. As was support for the people of Chile whose social democracy, with the electoral victory of Salvador Allende, had shown itself wanting when faced with the armed might of a fascist insurgency. The strength of support for the Chilean people in Liverpool was why so many of them found a welcome there when they fled into exile. This support for Latin American peoples was also expressed in the support for the Sandinistas in Nicaragua whose victory against the Samoza regime in June 1979 seemed to open the way of hope for the people’s of Central America. But there are always twists and turns in the road. Lack of vigilance means that the leadership of the movement can be side-tracked and taken down dead ends. This happened after the election of Tony Blair in 1997. Any organisation in Liverpool just seemed to dissipate and the May Day demonstrations that had seen tens of thousands marching to the Pier Head became an embarrassment as a handful of people would attempt to keep the tradition going. Even though there are even more reasons for people to be on the streets to show their anger after the ‘great bank robbery’ – where the bankers do the robbing – of the last six years and the direct involvement of Britain in disastrous, murderous and hugely expensive wars and interventions in Afghanistan, Iraq, Libya, Syria, for example, as well as the present day threat that the country might get involved in such ‘adventures’ in Iran and even the Ukraine, the streets today will remain quiet – or at best we’ll hear a whimper. It seems that today we are happy to send our sons (and, increasingly, daughters) to fight and die in other lands killing other workers but are not prepared to fight to maintain the gains of the past, let alone move forward to a better future. In 1886 the workers in Chicago were fighting for an eight-hour day. Now we hear of people taking work home as there’s not enough time in the workplace to complete their task; many people are putting in unpaid overtime in order to try to maintain their employment; and only yesterday it was announced in a report that there are 1.4 million (and probably many more) ‘zero hour contracts’ which provide maximum benefit for the employer and insecurity and uncertainty for the employed. A Happy May Day 2014 to all!